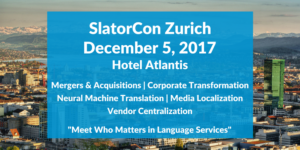 We are grateful to Slator for sponsoring Red T’s participation in SlatorCon Zurich. This cutting-edge conference brings together the language industry’s movers and shakers – whether LSP executives, M&A specialists, researchers, or language service buyers – to discuss the ever-changing nature of the business. It also presents a great opportunity for our founder and CEO, Maya Hess, to bring Red T’s mission to her home country and familiarize attendees with the cause. And all in Schwizertütsch (Swiss German).